Te Kawerau A Maki has proposed that a Rahui be placed on the Waitakere Ranges in an effort to deal with Kauri dieback. It is easy to understand the reasons why. The first Kauri dieback monitoring report produced 6 years ago suggested that kauri dieback presented a significant threat to the Waitakere Ranges. The second report, a draft of which was available over a year ago, suggests that things are much worse with infection rates doubling on some measurements in only five years. Although some work proposed after the second report was prepared involving improved hygiene stations and the employment of Kauri dieback ambassadors has been completed the really big decisions have yet to been made. Urgent upgrades to tracks and the construction of boardwalks need to be started now. TKAM spokesperson Edward Ashby is right when he says that the map of the presence of Kauri disease when compared to the existing tracks shows that the main spreader of the disease is humans. And it is clear to me that the current approach is not working. Not only should Council keep existing tracks through pristine areas closed but consideration also needs to be given to closing already diseased tracks to quarantine the disease and to stop its spread. One idea the local board has discussed is the creation of a map showing walks in the Ranges that do not go through Kauri areas. This would give people an option to go walking without the fear they are spreading the disease around. And we have to do whatever we can. If we fail to get on top of this crisis then in years to come the Waitakere Ranges forest will be a pale, weakened shadow of its current form. The Local Board hosted the second open day at Waikumete Cemetery recently. Sandra Coney deserves special praise for the event and for all of the work that she put into it. The cemetery was established in 1886. It is one of the larges open urban spaces in Auckland and occupies 108 hectares. It is the final resting place to more than 70,000 people. It is nearly full. Unless Council can unlock some land that is covered by a significant ecological area overlay we will run out of room in the next few years. The day before the open day it was my privilege to speak at the launch of Sandra’s latest book Gone West. The book is outstanding and is a fascinating read. It starts with the the ten great war memorials of Waitakere, including the memorial in Waikumete Cemetery, and then digs into the background of the people named in the memorials, their families and the effects the war had on everyone. The book really highlights the importance of places of remembrance and memorials so that the lives of those who gave theirs in protection of our freedom can be celebrated and those people remembered. The Waikumete memorial was constructed by members of the Auckland RSA for kiwis who died during the first world war, “our fallen comrades” in the words on the obelisk. And within this cemetery there are many graves and memorials of those who were killed during the war. The most distressing may be that constructed by the Browne family. Four of the five sons from that family were killed in the first world war. Cemeteries are vital, not just for those seeking a last resting place, but for the survivors, so that we can process the loss of a loved one and we have a physical place to go to to celebrate their lives. It is clear to me that Waikumete fulfills that important role very well. The Mayor has has announced a long term programme to improve Auckland’s water quality. As part of the programme the Safeswim website will have up to date water quality monitoring information available. The information is especially important for out west. Regrettably five of our Manukau Harbour beaches and three of our west coast lagoons regularly have long term water quality alerts. This is half of the total problem areas in the region. The reasons vary although for most of the Manukau Beaches infrastructure is implicated. As a matter of urgency I intend to continue to raise this with Auckland Council to seek that this is remedied. These beaches and lagoons should be swimmable. The local board has funded the preparation of a report into local water quality. The report is getting close to the stage where it can be released for public discussion. The intent of the report is to start a conversation with locals and to seek agreements on what we want to achieve and what the priorities should be. Henderson Massey chair Shane Henderson, Whau chair Tracey Mulholland and I recently met with Tusha Penney who is the District Commander of the Waitemata Policing District and Scotty Webb who is the Waitakere area commander. Tusha is an energetic and passionate Police Officer who is clearly wanting to improve police performance out west. She wants to focus police activity on Waitakere in recognition that because of poverty this area presents the most challenges. She was supportive of the Waitakere Ranges Safety hub, an office funded by the local board that is used by the local community constable. She was also very keen to improve community engagement. Out west there has always been a good relationship between community and Government departments driven by the realisation that the community has huge understanding and resources that can help Government departments perform their core roles. The specific matters that we discussed at this meeting were the problems being caused by parties held at Council hired halls and the support we could provide for a new police initiative seeking to address the effects of domestic violence. Further regular meetings with Tusha and Scotty are being scheduled. The local board hosted a meeting of a variety of groups interested in creating a Waitakere Pest Free area. A preliminary application to the Government Pest Free 2050 fund has been made on behalf of all of the groups. The groups represented included Forest and Bird, Arc Bufferzone, Ark in the Park, Gecko Trust, Oratia Native Wildlife Project, Weed Free Waiatarua, and Ecomatters Environment Trust amongst others. The design of the application will be an interesting process. But so far so good. Special thanks to Robert Woolf and Annalily van den Broeke who have both put a lot of work into the proposal. The local board had the pleasure of meeting elected representatives from the municipal association of Akita, Japan. Akita is a small (by Japanese standards) prefecture in Northern Hokkaido. They were visiting New Zealand on a fact finding tour. It was our pleasure to welcome them to Arataki Visitor’s centre and to talk to them about the Waitakere Ranges Heritage Area and environmental protection out west. I was invited to speak at the Whatipu bioblitz launch. The Bioblitz was the brainchild of Friends of Whatipu which includes Bruce and Trixie Harvey and Peter Maddison. Bruce and Trixie, who have a long standing link to Whatipu, have worked particularly hard on the proposal. It was hosted at Whatipu Lodge by the Mayor of Whatipu, Wayne McKenzie. The local board contributed a relatively modest amount of funding to the Bioblitz. For this investment Auckland receives the voluntary contributions of a number of enthusiastic young people collecting bio samples in the local area and the further contributions of a number of scientists analysing the samples. The intent is to measure the quality of the local biodiversity and to see what is changing when the results are compared to those of previous bioblitzes. By comparing the results we can understand what if anything is happening to the local environment. When the amount contributed is compared to the numbers of hours of voluntary work performed I am confident that the cost would be measured in cents per hour. Congratulations to Bruce and Trixie. I look forward to reading the findings. Councillor Linda Cooper and I and members of Sports Waitakere including Chief Executive Lynette Adams had the pleasure of attending the Kura at Hoani Waititi Marae and being on the receiving end of a spine chilling powerful performance by the Kapa Haka group. It was outstanding. I have had the pleasure of visiting the Kura a few times recently and I am really impressed with what is happening. The education is first class and the students are getting a deep and important immersion in their and our culture. 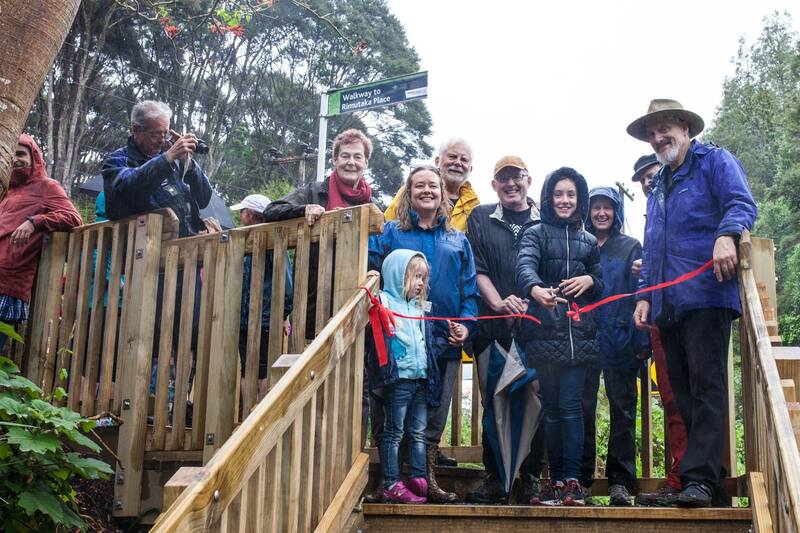 We finally managed to officially open the Rimutaka Place walkway and on a cold and rainy day we persuaded an enthusiastic young local resident to cut the ribbon. Many thanks to Neil Henderson for the tremendous work he has put into the walkway. Woodlands Park Primary have requested that we see if we can extend the walkway to the school. It appears that there are major private land issues but I agree that if at all possible we should have a network of walkways so that kids can walk to their local school and not have to be driven. Finally the annual Open Studios event has again been held. This is a yearly event where local artists open up their studios and welcome visitors from afar to look at and hopefully purchase some of their art. It is organised by a dedicated team including Renee Tanner and lets people interact with over 70 westie artists, potters, painters and jewellers. Again for a relatively modest contribution from the Board and a lot of passion and dedication from members of the community really interesting events can be organised and held and the local arts community can be strengthened.